Today was a hell of a day, a lot tougher than I expected. The first eight miles were basically all talus, all the time. 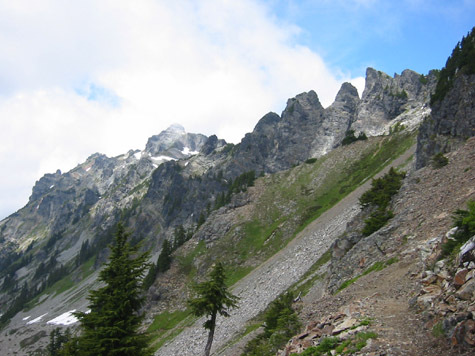 Talus is rockfall on the slope of a mountain, and often requires careful foot placement, plus a bit of scrambling when the boulders are large. Scree is the little stuff…pebbles and small rocks. Talus is the larger stuff, ranging from boot-size to refrigerator-sized boulders. My balance isn’t the best, although it’s definitely improved over the years! But talus has never been my friend, and hence my forward progress was rather slow. The weather made it much more complex, and much less rewarding. The ridge northwest to Chikamin Peak, and the entire Chikamin/Four Brothers area, was completely socked in…entirely covered with cloud, which was punctuated by heavy wind and the occasional bit of rain. It was just one thing after another, and I did not have fun. And I missed quite a bit of gorgeous scenery. Fortunately, after I rounded a ridge through Chikamin Pass, it was a whole different ball game. The talus was still there, but I could actually see; the clouds were gone, and the weather was much calmer. One of the other things that were bothering me was the mental inventory I was taking of my food. I calculated the speed at which I was travelling today, and what was in my food supply, and it wasn’t adding up. It definitely didn’t add up if there were more days like today, and I was getting a bit concerned. Anyway, I rounded that ridge, and suddenly the scenery was a) there, and b) really lovely. 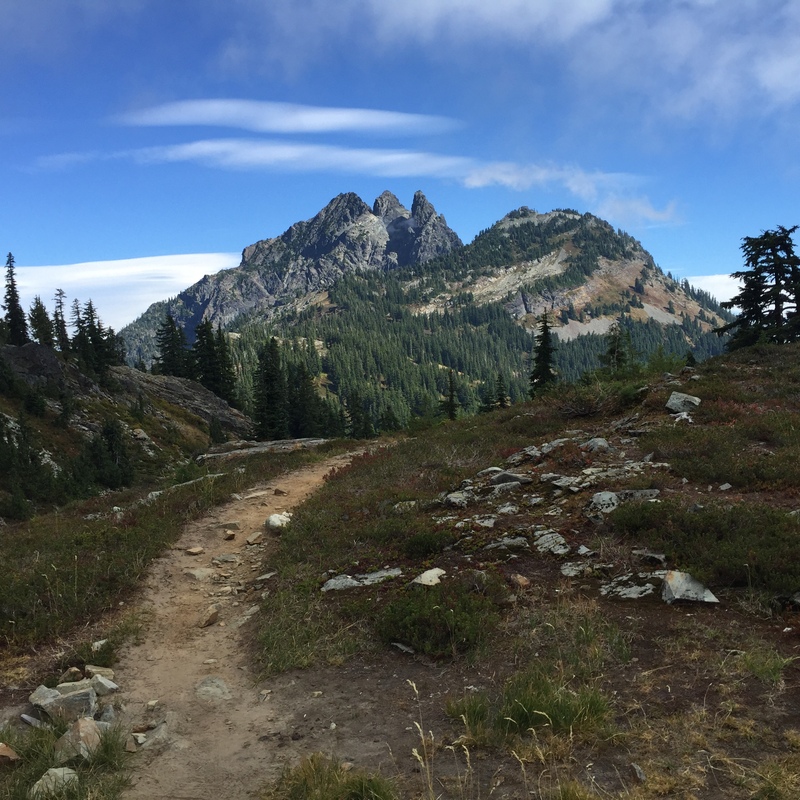 I continued the traverse down the ridge, and who did I meet but a retired couple, Unbreakable and No Trace, the kindest and humblest hikers around. They are on their second thru, and are Triple Crowners…a fact that they neglected to mention. We spent probably fifteen minutes talking about the trail, about being older than the average hiker, and all kinds of things. Fifteen minutes is a long time for an impromptu trail conversation. And without hesitation, they pulled out a couple of Idahoan instant potato packs and a Top Ramen, and handed them to me! Trail magic! And it really made a difference in my attitude. What a privilege it was to meet them! The scenery along this stretch is incredible. 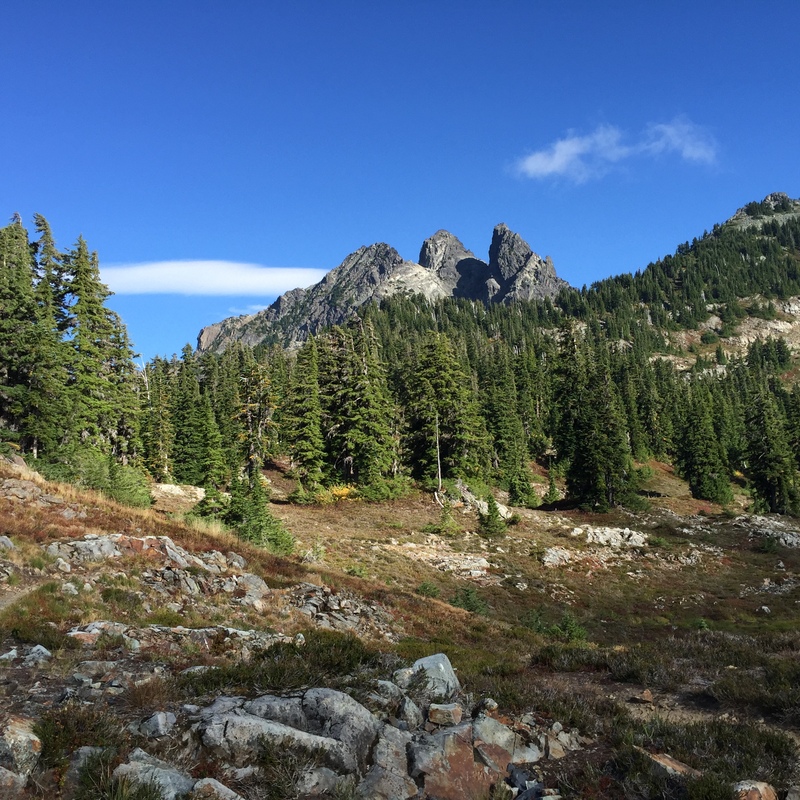 I climbed one last ridge, taking lots of pictures, including one of my beloved Mt. Stuart. Finally, I descended, perhaps 1500 feet, to the beautiful Delate Falls. There was a campsite just before the falls, so that became home sweet home. There was no convenient place to get water at the falls, unless I crawled under the bridge, but fortunately there was a spring just past the bridge. I topped off and went back to camp. Go figure, I’m really tired, so I’m not even going to do my evening route planning. That can wait until my brain is awake.